But what makes this book particularly special to me is its authors. 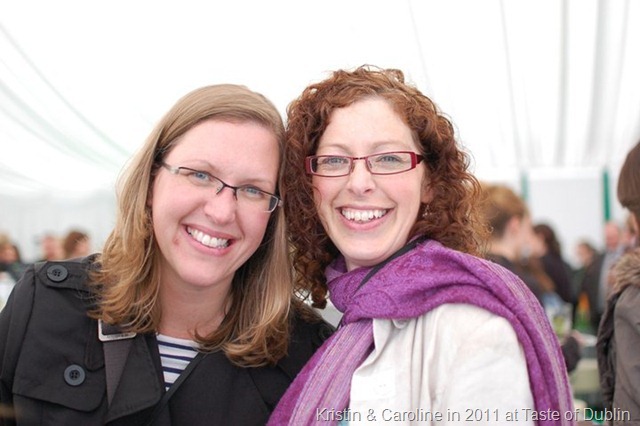 I “met” Caroline via email before I ever saw her in person, over 5 years ago when I was researching moving to Ireland. She was a contributor for a food magazine that I was writing for at the time, so I reached out to her for advice about being a freelance journalist in Ireland. She was incredibly helpful and warned me that work was quite hard to come by and that perhaps I should rethink the relocation. I moved here anyway…only to find she was right! After a year of scraping by as a freelance journalist I switched careers, which has served me well. She always says she’s happy I didn’t heed her advice – something we both chuckle about now. Shortly after moving to Drogheda (yes, that’s where I first landed! ), I met Kristin. We’d both been invited to a food blogger event at Bord Bia in Dublin, and though we only knew each other via Twitter and blogging, she offered to give me a lift as she knew I had no car and she lived relatively close. Being a fellow expat and American, we had so much to talk about and I don’t think we stopped chatting the whole way up and back. 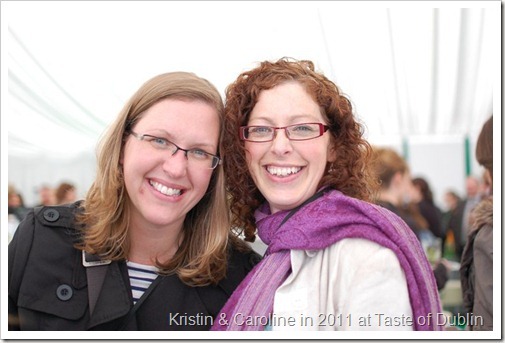 In fact it was that event that inspired Kristin and Caroline – still mere acquaintances at the time - to form the Irish Food Bloggers Association, their first collaboration. 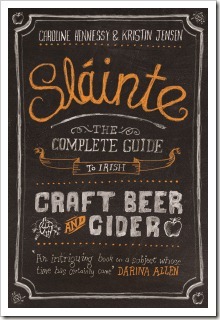 Looking back, there were so many little hints of this Sláinte project – though neither I nor they knew it back then. I remember having lunch with Caroline in Cork and her telling Mountaineering Man and I about a brewery her husband and a mate were starting. I recall her telling us what a massive project it was to get all the right equipment and ingredients and their vision was for the brewery (of course we all know Eight Degrees Brewing now!). And I recall sitting with Kristin over many dinners and seeing her interest in craft beers developing – probably starting with our first meet-up at L Mulligan Grocer, another key player in this dynamic duo’s growing passion for craft beer. 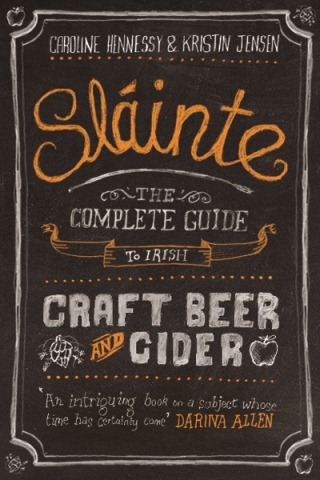 This book is really their homage to Irish craft beer, nurtured by a friendship born from a mutual curiosity for Irish food and drink, particularly the artisan producers who were helping to change perceptions of a cuisine that’s long had a less-than-appealing reputation. It really warms my heart to hold this incredible piece of work in my hands, a true labour of love by two brilliant writers whom I’m lucky to call friends. Sláinte includes some fantastic recipes by my fellow blogger brethren, including Lily Ramirez-Foran, Aoife Spud (aka The Daily Spud), Imen McDonnell, Donal Skehan and more. 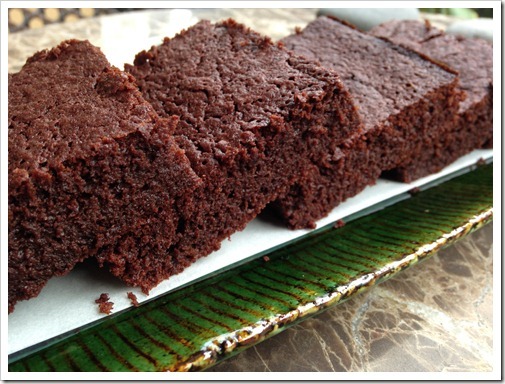 This recipe is Caroline’s, and these brownies have become legendary as she has demo-ed it at numerous craft beer events over the last few years – and anyone who’s given one a try is instantly hooked! 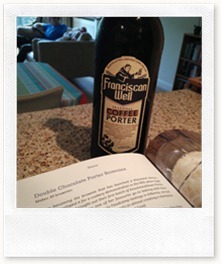 (Here’s the recipe on Caroline’s blog). 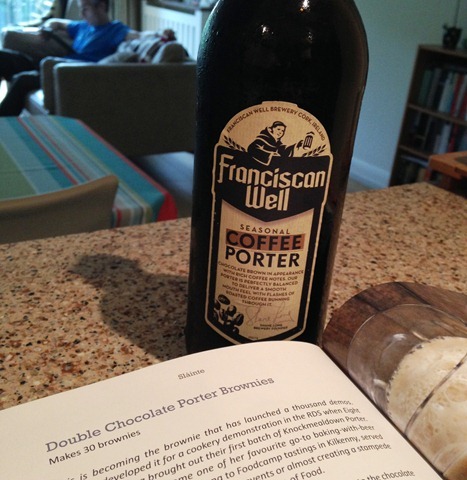 I should note that as my local off-license was sold out of Knockmealdown, I used Franciscan Well Coffee Porter and the recipe in the book offers other porter options as well. And speaking of my local off-license (McHugh’s), the nice fella who works there offered me spent grains whenever I’d like, a key ingredient to the N17 Spent Grain Granola Bars – another featured recipe in Sláinte . Craft beer – it’s all about community! Preheat the oven to 180°C (160°C fanbake). Line a rectangular 2 x 25 x 30cm Swiss roll tin with greaseproof paper. Sift the flour, cocoa, salt and baking powder together and set to one side. Gently melt the chocolate and butter together in a large heavy based saucepan over a low heat. Take it off the cooker and add the sugar, whisking until smooth. Allow to cool slightly, then whisk in the eggs, vanilla, porter and, finally, the sifted dry ingredients until just blended. Pour into the prepared tin – this is a very runny mixture – and bake in the preheated oven for 18-20 minutes until set and a skewer inserted into the middle comes out clean. Because of the amount of liquid used, you don’t need to underbake these brownies. It’s been a crazy few years – so glad you’re here to be part of it all, Clare. Love the food styling, by the way. 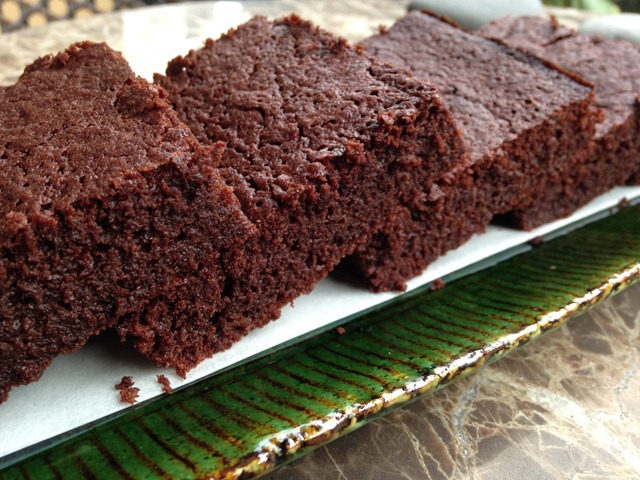 Those brownies are not easy to cut cleanly! What a lovely review Clare, and thanks for the mention! I’ve tasted these brownies before at a demo Caroline held at Electric Picnic and they were to die for! She’s right though, yours look perfect! You saw the ones that were divvied up, still hot out of the oven, Lily! There was no hope of food styling when the EP masses descended. I was just glad to get my baking trays back.